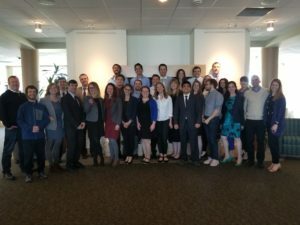 A group of students* from The Sustainable Innovation MBA Class of 2018 travelled to Washington, D.C. in May to advocate on Capitol Hill on behalf of CARE International. The CARE National Conference, now in its 16th year convening, brings together citizen advocates, corporate responsibility professionals, philanthropists, humanitarians, and international development experts for advocacy training and congressional meetings on Capitol Hill. Over the course of three days, the students participated in numerous educational sessions, learning about CARE’s impact and outlining the policy and political goals for the year. This year’s theme, “Your Voice, A World of Change” lifts up and celebrates the advocates whose voices help CARE continue to be the leader in creating positive change for women and girls on the global stage. The conference kicked off with prominent figures and speakers in the foreign aid space including Sally Yates, former Acting Attorney General; Helene D. Gayle; Senator Amy Klobuchar (D-MN), and multiple CARE and CARE Action! Voices. Designed for new CARE advocates, the conference hosts a comprehensive introduction to successful advocacy: Advocacy 101, Congress 101, and CARE: Our Story. New advocates leave sessions with enhanced legislative understanding and overviews of this year’s top priorities for CARE. 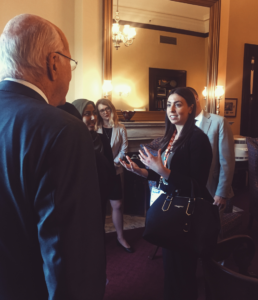 Prepared with discussion points for the advocacy day on Capitol Hill, The Sustainable Innovation MBA students set out to meet with the offices of Vermont’s Congressional delegation: Representative Peter Welch, Senator Bernie Sanders and Senator Patrick Leahy. 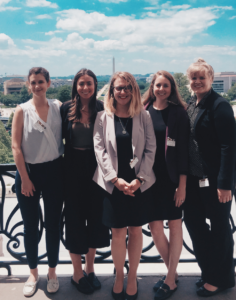 In the meetings with the Congressional offices, the students advocated for co-sponsorship of the International Violence Against Women’s Act, a bipartisan bill to ensure that gender-based violence is a top U.S. foreign policy priority. This issue is an important priority because an estimated one in three women will face physical, mental or sexual abuse in their lifetimes. Violence against women has an immeasurable impact on women and girls, their families and their communities. IVAWA elevates the importance of these issues and places them at the center of U.S. foreign diplomacy. The second request made to the Vermont delegation was to support the International Affairs Budget FY 2019 and request a funding increase that returns to the Obama-era funding levels. Proposed budget cuts by the Trump administration would slash funding for critical foreign assistance programs and jeopardize millions of lives around the globe. Vermonters are lucky to live in a state where all members of the delegation are receptive and engaged in policy to sustain funding for international aid and development. Over the course of the CARE National Conference the students gained great insight into the top priorities for foreign aid policy and how to engage with political leadership to influence change. 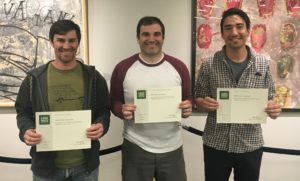 This year three Sustainable Innovation MBA students, ambitiously seeking to foster a greener economy, took on an additional workload outside their already busy schedules to prepare, practice and pass the test to become LEED Green Associates. Samuel Carey, Christopher Norcross, Robert Hacker (in photo, below, left to right) attended a LEED training workshop late in the fall, and spent the spring preparing. The final exam was not easy, but they all did fine. They are even contemplating going after the next level of certification becoming LEED Accredited Professionals, which would allow them to work as auditors. Today, the importance of LEED is underestimated, and the students believe that it will soon become the norm, becoming part of all building codes. The built environment accounts for more than a third of our total energy usage, as well as an immense amount of fresh water. And buildings take up a lot of space, disrupting natural drainage systems and increasing the urban heat island affect. Leadership in Energy and Environmental Design (LEED) is a certification system made to create greener buildings and more livable urban environments. It is estimated that people will spend up to 90% of their time indoors, so it makes sense to prioritize both healthier and more environmentally friendly buildings. The students were impressed by the organization and stages of development of a LEED project. They saw significant overlap amongst topics and core concepts from their SI-MBA course work. LEED projects start with stakeholder engagement and cross-functional team planning in a process called a Charrette. There, they must decide what characteristics the design will prioritize, and in which LEED categories it will receive points (i.e. Energy, Water, Sustainable Sites, Transportation, Materials and Resources, etc.). There are certain prerequisites that all LEED certified buildings must adhere to, but the remaining points are awarded as credits from a list of many. This enables the design team some flexibility and creativity. LEED awards more points for certain aspects based on overall priorities. Reducing greenhouse gas emissions is the highest priority goal, so more credits are awarded for implementing energy efficiency, benign refrigerants and renewable energy. Overall the LEED GA certification was an incredibly rich learning experience. 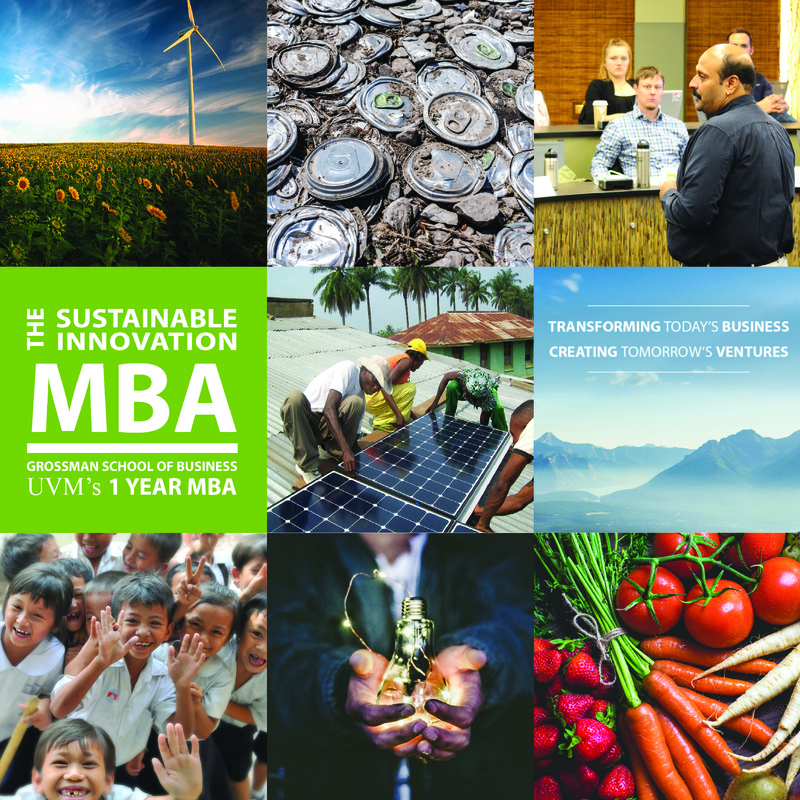 The students think that some LEED training should probably be integrated into the SI-MBA program as the concepts and strategies are indeed incredibly impactful to continue transforming today’s businesses and creating tomorrow’s ventures! This post was written by Dana Gulley ’17, founder and lead consultant of Third Peak Solutions. She can be reached at dana@thirdpeaksolutions.com. You could say I was stoked when the postal carrier slid the May 14th edition of High Country News through my mail slot last month. The twice-monthly magazine covers conservation issues “for people who care about the West,” and over the last nine months, this New Yorker had become one of those people. Flipping through the pages, “Your stoke won’t save us: the idea that outdoor recreation leads to meaningful conservation rests on a very big ‘if,’” by Ethan Linck, jumped off the page at me. 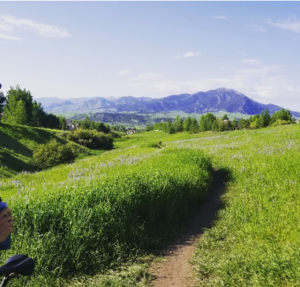 Since moving to the little city of Bozeman, Montana last fall, my increased focus on rock climbing, mountain biking (photo, left), canoeing and backpacking has brought me closer to the outdoor recreation community, a community that is at the heart of this place and many others like it. That said, I’ve felt strangely further away from my conservation roots. I devoured the article, nodding, admittedly a bit self-righteously, through all 3,000 words. Yes, yes! This is what I have been saying. Outdoor recreation does not solely predict one’s environmental attitudes! While the outdoor recreation industry is willing to make increasingly political statements about protecting our wild places, they’re yet to show they are willing to pay for that protection! And my sustainable business training rushed back: we don’t need to settle for trade-offs! Businesses can do well by doing good. The euphoria of seeing my opinion in ink was quickly replaced by guilt. Okay, so our environmental issues continue to mount and there’s opportunity being left on the table. What have I done about it? Those petitions I hawked as the outreach director for Riverkeeper, a clean water nonprofit in New York’s Hudson Valley, seemed like a distant memory, even though I spend more time in outdoor places than ever before in my life. And as a strategy consultant, I have found myself focusing on the more familiar world of non-profits as opposed to supporting and promoting sustainable businesses. As stoked as I was to read the article, I felt simultaneously counterfeit. With all the changes in my life, I had somehow lost my tribe: that community that is so essential to having the courage to face a big problem and do something about it. And I knew that tribe must exist here. After all, in 2015 the Montana state legislature was the 29th in the nation to pass a law that allows companies to legally register as benefit corporations. Later that week, Business for Montana’s Outdoors, a coalition that includes some 180 businesses, hosted a panel discussion, “Tech and the Outdoors: How the ‘Montana Mystique’ is Fueling Business Growth.” In Montana, the tech industry provides 15,000 jobs and $1.03 billion in wages, and it’s growing fast. Panelists from several of Bozeman’s mature tech companies and start-ups focused on the competitive advantage Montana’s outdoors provides in everything from attracting and retaining talent to entertaining clients and customers. Panelists shared countless examples of how their companies were more successful because of Montana’s beautiful and enjoyable natural environment. What they didn’t share, were innovative ideas for how their businesses would ensure the ongoing protection of the outdoors, something they acknowledged was a critical asset. 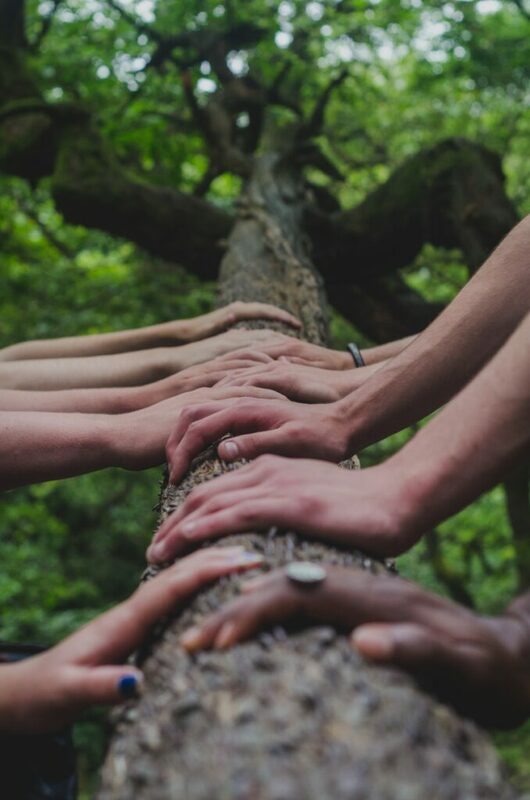 The research shows that millennials are increasingly interested in being part of companies that they can feel proud of, companies that are actively doing something about the problems we face. And in the age of Patagonia replacing its product homepage with “The President Stole Your Land,” while mounting an aggressive lawsuit to fight the historic removal of public lands in Bear’s Ears National Monument, businesses have more permission than ever to act. 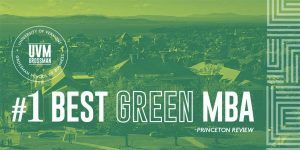 Determined to push the envelope and proudly gripping the High Country News magazine, I stood up, and channeled the collective strength of my tribe, my Sustainable Innovation MBA cohort from the University of Vermont. I hear how Montana’s outdoors helps you, but how will you help the outdoors? While I was initially frustrated by the lackluster response (some non-profit donations here, a volunteer trail building day there), this experience reminded me of something I had lost sight of: if we are to overcome the momentum of the status quo that pushes businesses to think the same way they always have, then we must each harness our respective tribes and act now. Businesses need our help, as consumers and consultants, to innovate new models of corporate social responsibility that address the world’s problems while helping them thrive. We don’t have to start from scratch. As an outdoor recreator, I can be an ambassador for environmental advocacy in my community, limit my consumption by purchasing used gear or new gear from unparalleled companies like Patagonia, and support organizations like Protect our Winters (POW), a climate advocacy group that organizes outdoor enthusiasts to take action. As a consultant, I can build on the momentum of the 2015 law here in Montana to pursue for-profit clients and develop and share sustainable business best practices. In case it inspires you to act, too, consider this my call for tribe-members and to recommitting myself to contribute to solutions instead of nodding along vigorously at the problems. And while these actions alone won’t save us, I’m stoked to do my part. Sap! 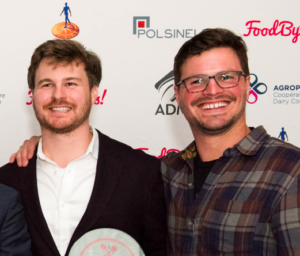 Beverages, which makes sparkling superfood beverages out of maple and birch tree sap, took the judges’ “Highly Commendable Award” at the recent FoodBytes pitch competition in Montreal. Sap! was co-founded by The Sustainable Innovation MBA alumnus Chas Smith ’15 (left, in photo) and has been on a hot-streak in 2018, appearing on the ABC pitch show “Shark Tank” and being named a product trend to watch by Whole Foods Market. FoodBytes! is a next-generation pitch competition that aims to discover the most ground-breaking food and agriculture (F&A) startups and provide them the mentorship and connections they need to grow. Since launching in 2015, 190 startups have pitched on the FoodBytes! stage, 1,250 startups have applied from 35 countries and more than 3,000 people have attended events in North America, Europe and Australia. Entering Kalkin 110 on a particular mid-April day was unlike any day before it; a lively if not curious environment awaited inside the classroom. 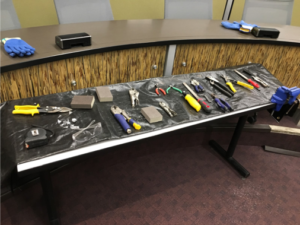 Against the auditorium style seating a table was set up and laid out with what could be confused as the tools from Dexter’s laboratory, a motley assortment of pliers, saws, metal files, and safety goggles were spread over a black tarp. On a second look around the room you notice a type of pinball style launching devices affixed to the front desk, a ping pong ball loaded into its cartridge, aimed at narrow vertical strip of peg board. On the ground in front of the desk beyond the pegboard barrier were two lines of tape outlining what we would come to learn was a landing strip of sorts. We were not sure what to think of this odd display as we took our seats, but were quickly informed by the excited and jovial explanation from Mike Rosen, our guest lecturer for the day. 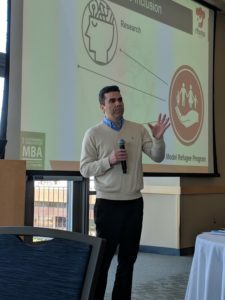 Mike, an engineer and Research Associate Professor at University of Vermont, had come to the Grossman School of Business to teach a workshop on Design Thinking for The Sustainable Innovation MBA 2018 cohort. Mike, after telling us a little about his background, passed out an eclectic set of supplies to the pre-divided teams and told use what the challenge for the class would be. Using the launcher at the front of the room, the tools, and materials provided: pegboard, small metal sheets, PVC piping, ping-pong paddles, and various other connector type elements, we were to construct a device to divert a ping-pong ball around, over, or through the vertical pegboard barrier and land within the landing strip on the ground designated by red tape. Each team after understanding the challenge would get opportunity to ideate, prototype and test a device in order to achieve the unconventional task. Arguably, California is the country’s leader in climate action, with an ambitious goal of deriving 50 percent of the state’s energy from renewable sources by 2030. The state is on its way to achieving 33 percent by 2020 and just made a huge step toward making its goal a reality. In 2 years, all new homes built in the state will be mandated to either have solar panels installed or be hooked up to shared solar panels that power a grouping of the new homes. New home buyers will have the option to purchase the panels outright where they are included in the price of the home or can be leased. 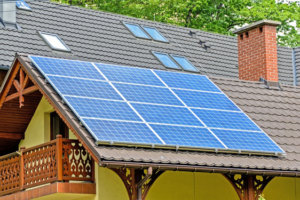 The increasing amount of solar energy to be included in the energy mix is sure to help achieve the state’s aforementioned energy goals, but the requirement for new home owners to purchase rooftop solar has the potential to surface unintended consequences. The requirement is expected to add $8,000 to $12,000 to the cost of a home. In a state where affordable housing is hard to come by, this mandate certainly would not help that issue. What about those who can’t afford solar? 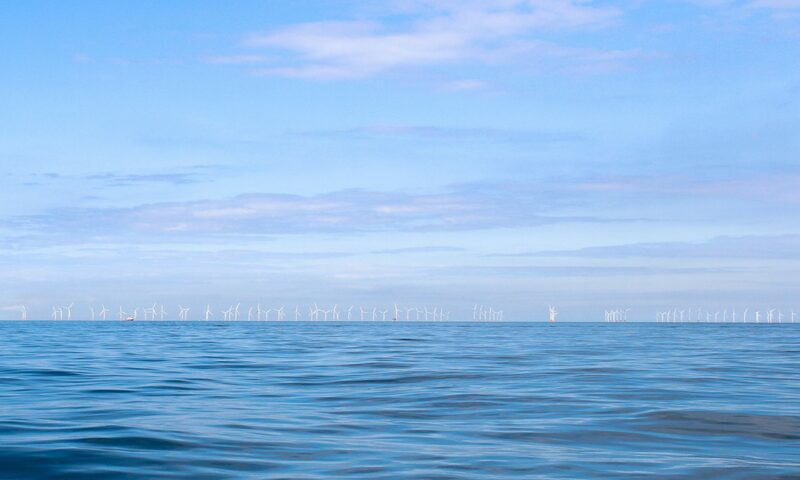 It’s an interesting problem, as moving towards a renewable energy future is critical, but yet some will not be able to contribute to this shift. Companies like Tesla have acknowledged this issue and made it clear that they are working to make their products affordable for all but say that they must achieve adequate economies of scale before that dream can become a reality. Also, households that don’t have access to smart energy technology in the state could potentially be left in the dust once the new rate structure hits the state next year. Utilities will charge energy customers based on what time of day they use electricity, making it difficult for those without access to this information to know if they are using their electricity most efficiently. The energy supply does not equal demand at many points in the day, and those that have batteries, like the Tesla Powerwall, will be able to store energy until when it could be most effectively utilized. Until these technologies are affordable enough to become a part of more households, consumers may not be seeing the full savings possible from solar. Is now the time for a mandate such as this one, or should technologies that further enhance solar efficiently be developed further? 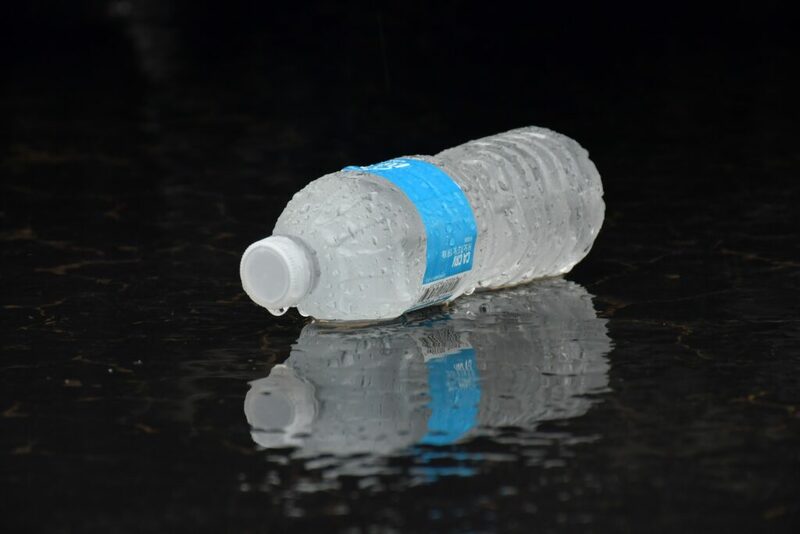 What happened to that plastic bottle you threw in the recycling? Do you really have to rinse out that milk jug before putting it into the recycling? A little left-over yogurt doesn’t make a difference? Can you recycle plastic bags? If you are like a lot of people you probably don’t, and you hope or wish that the items you put in the bin get recycled. But this “wishcycling” can actually do more harm than just throwing contaminated or non-recyclable items away. 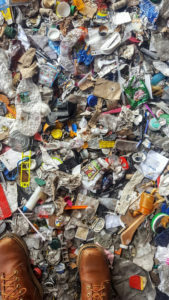 On a recent site visit to Casella Waste Systems‘ Charlestown recycling facility in Massachusetts, I learned a lot about what happens to products after they go into the blue bin. At the recycling facility we visited, contamination was visible throughout our entire tour. Film plastic bags clogged the machines, small items fell through the cracks, and foreign metal objects damaged equipment. All of these items are not allowed in the zero sort recycling bins, but still manage to find their way in and wreak havoc. During our tour of the recycling facility we learned more about the challenges that recycling facilities face. One of the major challenges is food contamination in the recycling stream. This can range from unwashed containers to cans still full of food. This has a massive impact on a recycling facility because items are sorted using all sorts of gadgets. To sort plastics the facility uses optic readers that read the type of plastic and send out puff of air to sort plastic. Other parts of the facility use things like magnets to sort material. Because so much of this system is automated and is carefully calibrated to deal with clean materials contaminated items don’t make it through the system. When non-recyclable items don’t make it through the system they are sent to the landfill or to an incinerator. This includes all of those small plastics, random pieces of metal, plastic bags, and more. This is why it is really important to check with your local recycler to see what products they take in the blue bin and which have special instructions. The trouble with recycling doesn’t stop at the facility though. The bundles produced by recycling facilities still have some level of contamination. 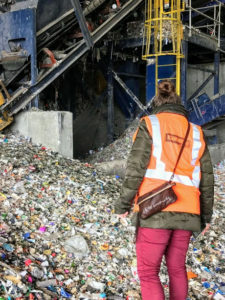 The largest buyer of recycling was China, but they have closed their doors to recycling with contamination levels above 0.5%, which is beyond the technological capability of any recycling facility today.